Your little ones don't have to wait to be a big kid to have great style. SoYoung's Toddler Backpack works for the smallest in your family and is easily taken care of with machine-washable linen. Sized to fit a folder for kindergarteners! Black and white bunny adorableness meet monochrome sophistication. Canapes for a snack, anyone? I bought a giraffe toddler backpack for my son in 2014 and I am amazed at the improvements that have been made since then (and that bag is still going!) 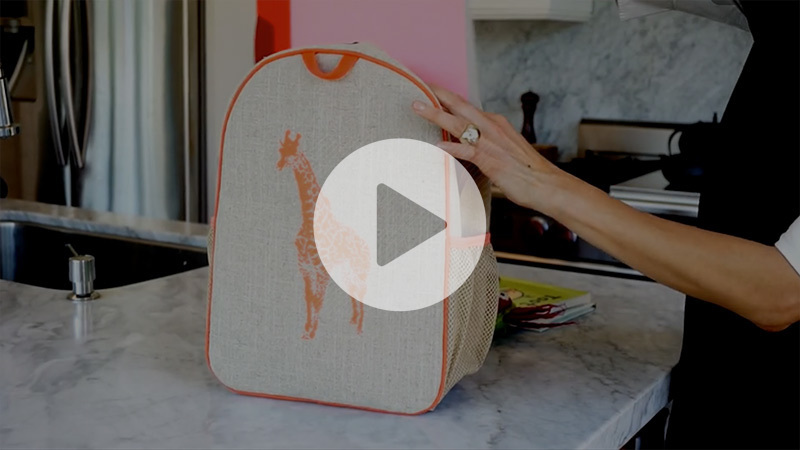 This is a rugged bag that can handle what a 3 year old can throw at it. The material is beautiful and I love that the designs are not cartoon dogs, cats, buses, etc. Thank you for giving parents a better choice! Bought this for our 18 month old granddaughter and she loves it. She put it on and strutted around the house in it for an hour. The animal pictures on the backpack are helping with her vocabulary as well. my 4.5 year daughter loves it! light weight, cute design, and adjustable straps so she can use it well into school years. This is a great little backpack! My son uses it for daycare and it holds three extra outfits, a blanket, his jacket and hat. The side pockets are great for holding his water bottle and sunscreen. Love the design of this bag, the material is fantastic, and it's just super adorable watching him waddle into daycare with him wearing it on his back. We get a lot of compliments on the bag and have told many people where they can find them!